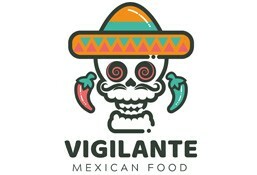 Vigilante is currently closed for delivery and it will open at . Beef with black beans, peppers and onions, salsa, sour cream and cheese , of crisp romaine lettuce. Served with lite chipotle dressing. A large soft flour tortilla Mexican rice, black beans, sauteed peppers and onions, salsa and cheese. Mexican rice, black beans, sauteed peppers and onions, salsa and cheese.